This isn’t an article about the popular children’s books by Eric Hill. Instead this is about a different kind of dog; one that is sturdy and sure-footed and can carry equipment to help with search and rescue operations. But Spot isn’t a German Shepherd or a Labrador. It’s a robot. 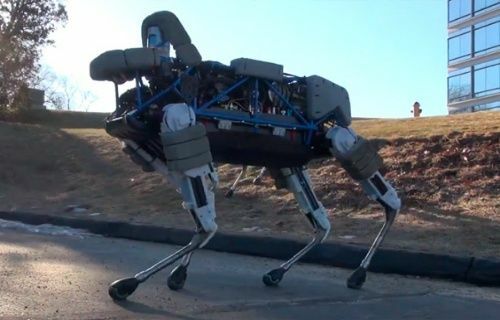 Spot was built by Boston Dynamics (a subsidiary of Google) with funding from the Defense Advanced Research Projects Agency. It weighs in at 73kg and is more nimble than its heavier predecessor BigDog, although it can’t carry as much equipment. However Spot is faster and better able to navigate treacherous ground; as you can see from this video it’s very hard to make it lose its footing. This means that it would be more useful in search and rescue situations, as it is less likely to overturn than BigDog. Spot is the latest robot from Boston Dynamics, but not necessarily the coolest. There’s also SandFlea, which can jump incredible heights, and Cheetah which can run faster than Usain Bolt. There are also humanoid robots such as Atlas and Valkyrie, the latest versions of which are untethered and operate solely on battery power.